I've been coughing and spluttering for the last week and I currently have no voice at all and when I get sick like this, I tend to get lazy. Especially when it comes to dinner. The last thing I want to be doing is slaving over the stove - so I like to whip up something quick, but also something that's healthy and delicious. 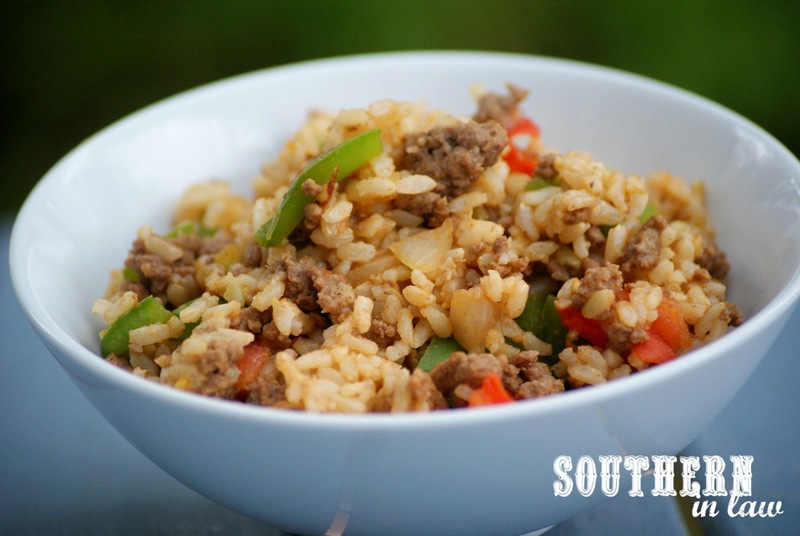 Mexican flavours are always a hit in the SIL house and we always have brown rice made up and ready to go in the freezer. 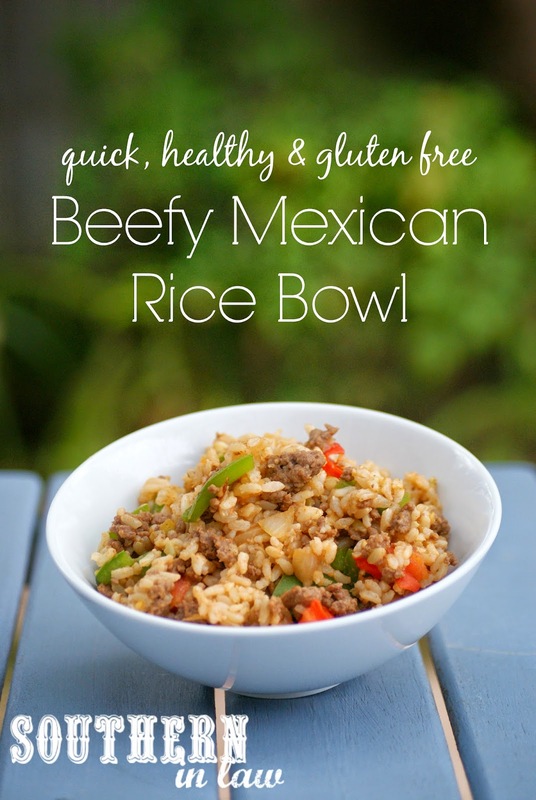 Combine the two and you have this Beefy Mexican Rice Bowl - well, that's what we call it around here anyhow! This is one of those one pot wonders. 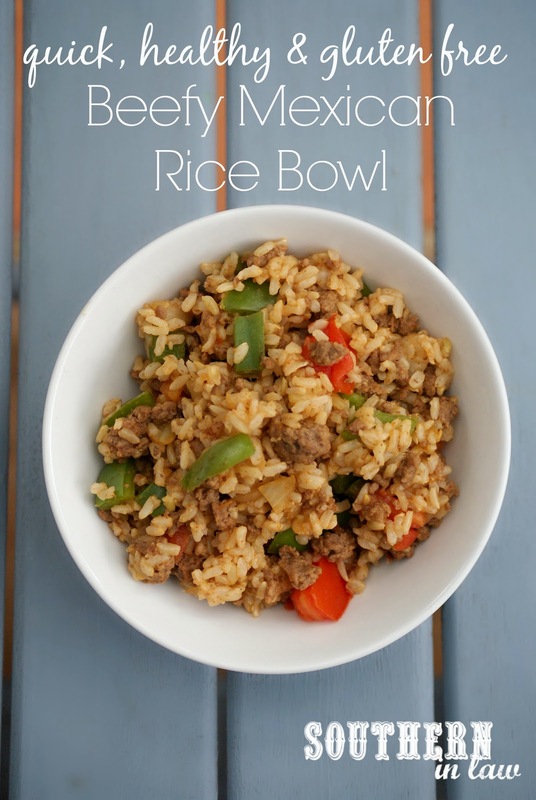 You can add anything you like and a healthy and delicious dinner will be on the table in 15 minutes (as long as you have some rice already cooked!). Jussssttttttt the way I like it! Truth be known... it's not just when I'm sick that I love dinners like this... it's every night ;P Quick healthy dinner recipes are my fave because I need to get in and out of the kitchen as quick as possible so that Mum can cook her and Dad dinner. In a small saucepan or frying pan over a medium heat, cook your beef and onion until browned. Add in your seasonings and cook for 2 minutes until fragrant. Add in your capsicum and cook until softened. Add in your tomatoes and rice and stir until warmed through and all ingredients are combined. *If you want to make things even easier - use taco seasoning instead! Simple, healthy & delicious - that's how we like it! But tell me, what are your quick meal favourites? For breakfast we love Healthy Baked Banana Breakfast Cheesecakes or Breakfast Bakes as we only need to add toppings, for lunch it's usually a sandwich and for dinner this is a favourite for Jesse whilst I love to keep Mini Pumpkin and Feta Frittatas or Cheesy Quinoa Bakes for dinner in a rush. Yay for no fuss! Your quinoa sounds amaaaaazzingggg! Just made it, loved it! Any suggestions for how to re-heat the leftovers properly? And can it be frozen and reheated? Any and all info would be appreciated, I'm very much a beginner at cooking in any way, shape or form! Brilliant, thanks so much for this :D That's dinner sorted for the next week! Any substitution for corn flour ?